Any regular readers of my blog will know that I'm up to my eyeballs in clearing out my garage. I won't bore you with any more details but rather share with you one of my finds. Going through boxes of youthful memories can throw up some little nuggets of entertainment. When I was 18 (I think) I went out with a guy called Bill who was training to be a graphic designer, or was just about to start, or something. I can't remember the details. Anyway, I met him before the advent of social networking, through a magazine, and I think it was a football one, but I can't remember - it would have been my brother's if it was... 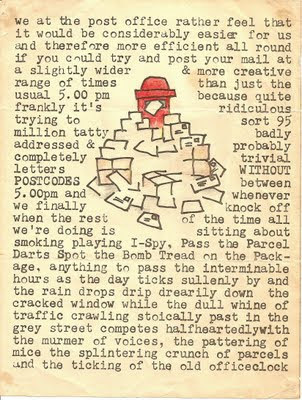 I have no idea why I was browsing the 'lonely hearts'/penpal columns, but I came across Bill and sent him a letter. He actually wrote back and, with youthful confidence, I invited him to a party one of my friends was having. He came all the way over from the other side of London and we had a right jolly time. We ended up going out for a while, then we stopped and that was that. While we were an item, he sent me regular letters decorated in his own inimitable style. 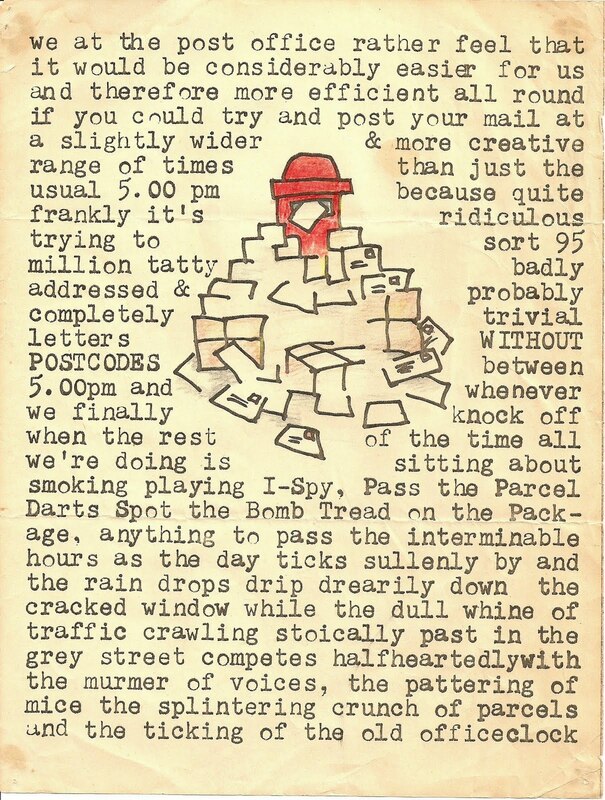 He also sent me other bits and bobs, including this one as a sort of advert for getting people to use the Post Office at other times than a last rush at 5pm, plus a reminder to use the postcode. It hasn't lost any of its retro wordy appeal.